Details: Printed Reebok logo, LFC crest and shirt sponsor. Player name, number and Premier League badges felt. The 2003-04 Liverpool Away Shirt made by Reebok has a white base colour with a red stripe running across the top of each sleeve. 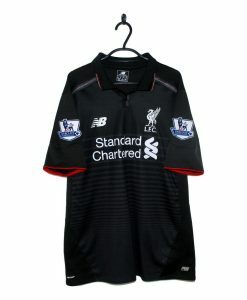 A black Reebok logo is placed on the right breast with the LFC crest on the left. Carlsberg have their logo in the centre of the football shirt coloured green. As worn by Robbie Fowler.